Several of you have emailed and asked what we are using when I mention our 'geography songs'. 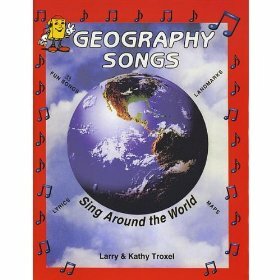 Last year I purchased a song book and CD set from Rainbow Resource that is called Geography Songs: Sing Around the World by Kathy Troxel/Audio Memory. Now while the songs are super-catchy, you will find yourself humming various songs ~ especially if you wake up in the middle of the night and can't fall back asleep. We try to sing the song that goes along to the area we are studying every day or every other day. The first few days we get the country names down and then move over to a map and point out the countries while we are singing the song so we can get a bigger picture of where the countries are. I can honestly say that the kids aren't the only ones learning something using the songs! We have these and enjoy them too! We bought our set on cassette about twelve years ago, and we still use it. The Canadian provinces song isn't so great for us (I wish they had sung them in some kind of order! ), but I do hum the different U.S. songs when I have to remember what's north of Georgia or south of New York. frist time to come to your blog. I printed out a few things and will be coming back. Thanks so much! I'll add that to my download list. My kids love songs. I think kids learn and retain facts and information when they hear it through music. I will have to check into this when Selena is ready for these type of studies. Thank you for sharing. Thanks! I've heard a sample of these songs and they seem great. I'll have to get them next time I go school shopping.